Spicy Yogurt Marinated Turkey – with yogurt’s natural tenderizing powers, this bird comes out tasty, tender and juicy with a flavorful, spiced-up gravy. If I tell you how many turkeys I’ve roasted in the past 2 weeks – promise not to laugh? I think I’ll wait ’til the end to tell you – better if you hear the whole story first. But I will tell you that the result of my two-week turkey preoccupation resulted in this tasty, tender, spicy yogurt marinated turkey. It’s a Turkish-inspired recipe with bright and zesty flavors of yogurt, lemon, garlic and Aleppo pepper. Roasting a turkey is challenging! 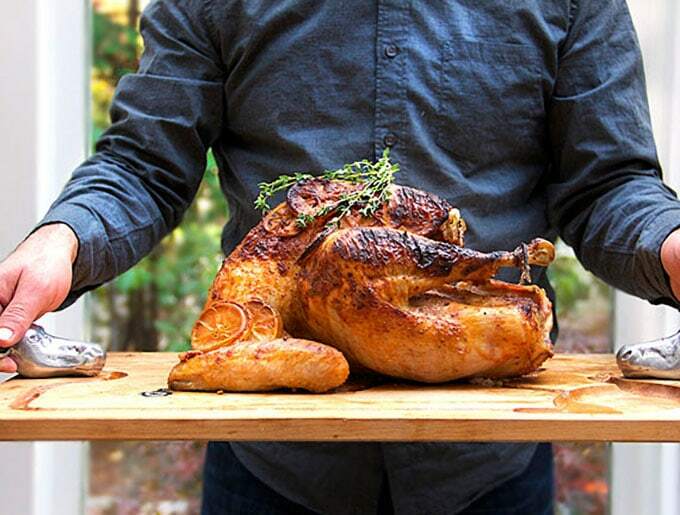 How do you cook a giant bird for hours without drying it out and making it tough? Every Thanksgiving there’s a buzz about some new innovative approach. I’ve tried so many techniques over the years: brining; spatchcocking; disassembling: basting with butter over a cloth-draped bird; smoking; high-heat for a shorter time; low heat for a longer time…. I’ve enjoyed many of these turkeys over the years – but not enough to stop me from searching. When you’re cooking a turkey (or – in my case – many turkeys) it’s so much easier and more fun when you have great equipment for the job! I’m happy to tell you that you have a chance to win these same great turkey tools! You’ll find the form to enter the OXO TurkeyDay Giveaway at the end of this post. Good luck! In case you’re not familiar with the brand, OXO is a company that makes innovative kitchen tools and housewares. Their mission is to “make products that make a tangible improvement in peoples’ daily lives.” I’m a longtime fan of OXO and so happy to be partnering with them on this post and offering you a chance to win these great TurkeyDay tools! I decided to harness the magical tenderizing powers of yogurt to roast my turkey. I’ve had tremendous success with yogurt-marinated chicken on the grill! I was excited to try the same approach with my turkey. My idea was to create a thick coating of deliciously spiced yogurt to coat the bird. 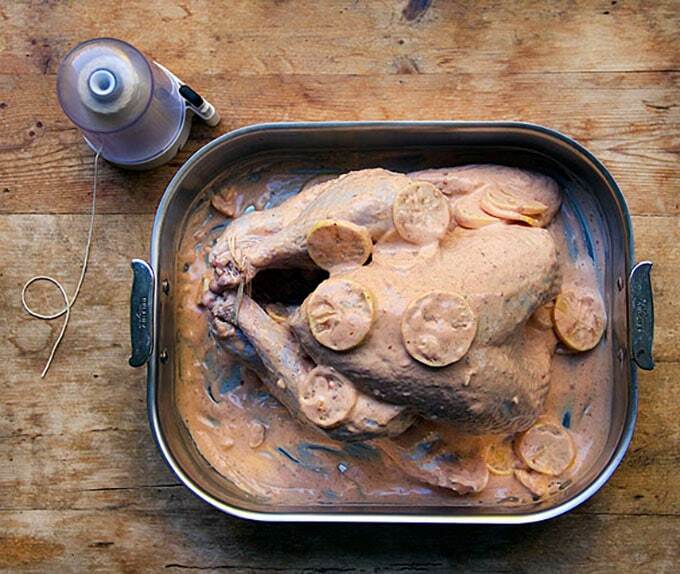 I had a feeling that marinating and cooking the bird in yogurt would tenderize it and keep the it moist and juicy throughout the cooking process. I did some research on cooking with yogurt. It turns out yogurt becomes unstable when heated to high temperatures – that’s because of its protein content. I discovered that the higher the fat-to-protein ratio, the more stable the yogurt. So using low fat or fat free yogurt for cooking is not going to give you a creamy sauce. One of the most interesting resources I found online was a bunch of forums – Indian cooks – discussing how to prevent yogurt-based curries from curdling. The one tip that was widely agreed upon in the forums was to whisk yogurt in one direction only, so as not to break up the protein bonds. I couldn’t corroborate the scientific validity of this advice, but I figured it couldn’t hurt to follow it, so I did! I also learned that you can temper yogurt by whisking in flour or cornstarch. I tried that on one turkey. It didn’t seem to make too much of a difference so I decided it would be better to keep the recipe gluten free. I tried basting a couple of turkeys with brown butter. 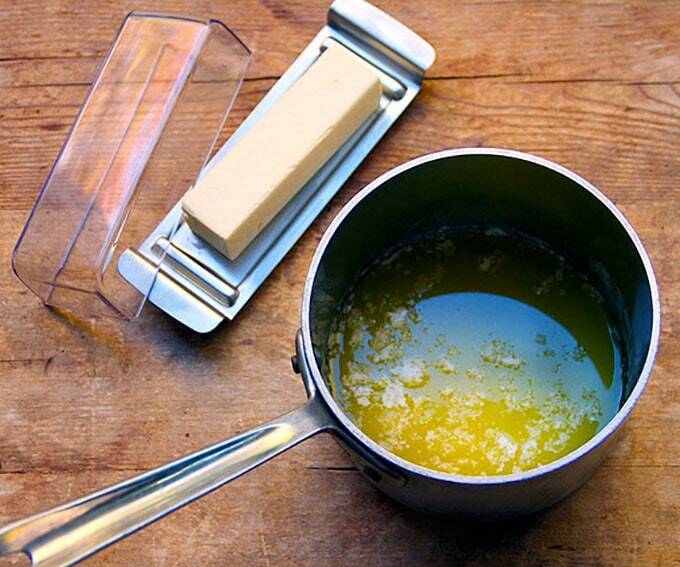 Brown butter has a rich nutty flavor that I’ve enjoyed in other Turkish recipes. It was good but in the end I felt that it overpowered the gravy – I preferred plain butter. After defatting the pan drippings, I pureed them along with all the garlic cloves that roasted with the turkey. The result is a rich, spicy gravy. The one issue that took me the longest to pinpoint – 4 turkeys later – was that not all whole milk yogurts are created equal. Some have a built-in stabilizer! Turkey Number One had the best coating of the first four turkeys. I used Stonyfield Farm Smooth and Creamy yogurt for that turkey. For the other three I used Fage Total Greek yogurt. After a lot of frustration with the coatings and sauce quality of turkeys two, three and four, it finally occurred to me to compare the ingredients in the two yogurts. Stonyfield adds pectin to their thick and creamy yogurt. Fage doesn’t. Pectin is a stabilizer! It keeps the yogurt together – smooth and creamy – even when cooked at a high temperature. One last finding: Of the 6 turkeys that I roasted, four were fresh young turkeys and two were free range. The fresh young turkeys were way more tender and had a lot more meat than the free range birds. 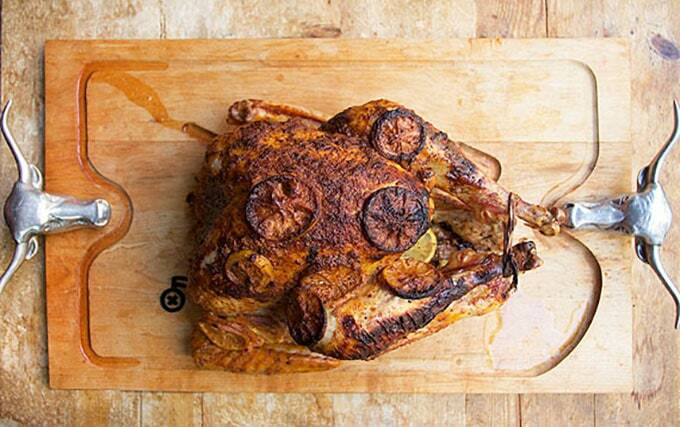 Here’s the recipe for Spicy Yogurt Marinated Turkey. If you try this recipe I hope you’ll come back to leave a comment and let me know what you think. Rinse and Truss the Turkey Remove the neck and giblets from the turkey and reserve for another use. 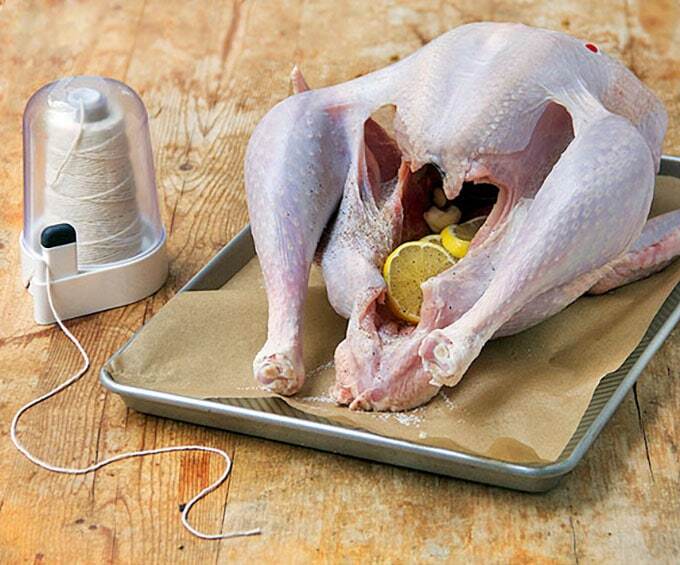 Rinse and dry the turkey inside and out. 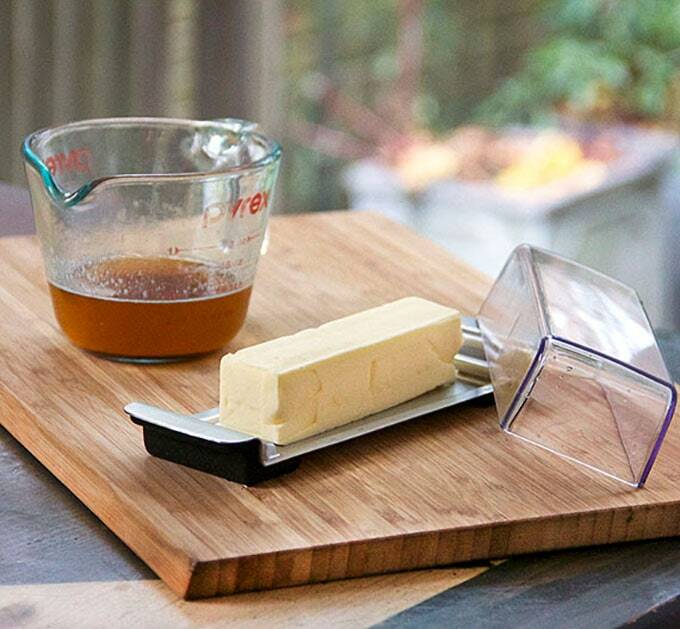 Set it in on a work surface or in a large baking pan. Sprinkle the cavity with salt and pepper and put 2 lemon slices and 3 garlic cloves in the cavity. 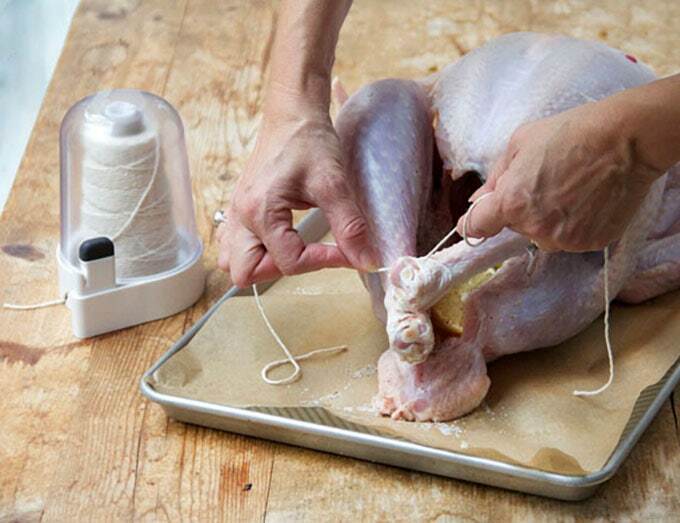 Truss the legs of the turkey by cutting off a 12-18 inch piece of twine and tying the legs together (see photo on the blog). Make the Marinade Spoon the Aleppo pepper (or the red pepper flakes and paprika) into a large bowl. Add 2 tablespoon of warm water (3 tablespoons, if using pepper and paprika) and stir to moisten the spices. Set aside for 5 minutes. Add the yogurt, tomato paste, olive oil and salt to the bowl. Mix gently with a fork, stirring only in one direction, until the ingredients are just combined. Add the remaining lemons and garlic to the bowl, and gently stir, in the same direction. Coat the Turkey with Marinade Preheat the oven to 450ºF. Place the oven rack in the lowest position. 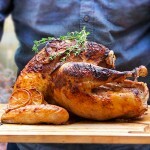 Make sure the trussed turkey is in your roasting pan – breast side up. 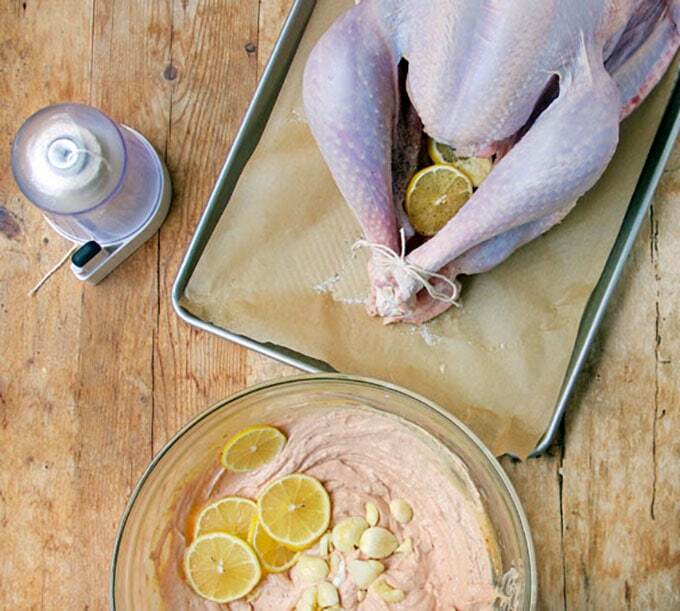 Pour the yogurt marinade over the top of the turkey. Lift the bird by the neck and, using your hands, smear some marinade over the bottom of your turkey. Pat marinade over the wings and legs and any areas that are bare. Let the turkey sit with the marinade at room temperature for 30-45 minutes. (Or you can marinate the turkey for up to 24 hours in the fridge). Roast the Turkey Before cooking, mound excess marinade onto the turkey. Remove any garlic cloves from the top of the turkey to prevent them from burning, leaving them in the pan. Gently place some lemon slices around the top – decoratively, if you like. Roast the turkey at 450ºF for 30 minutes. Remove the pan from the oven and set it on a heat-proof surface. Gently pour the melted butter over the top of the turkey. Return the turkey to the oven. 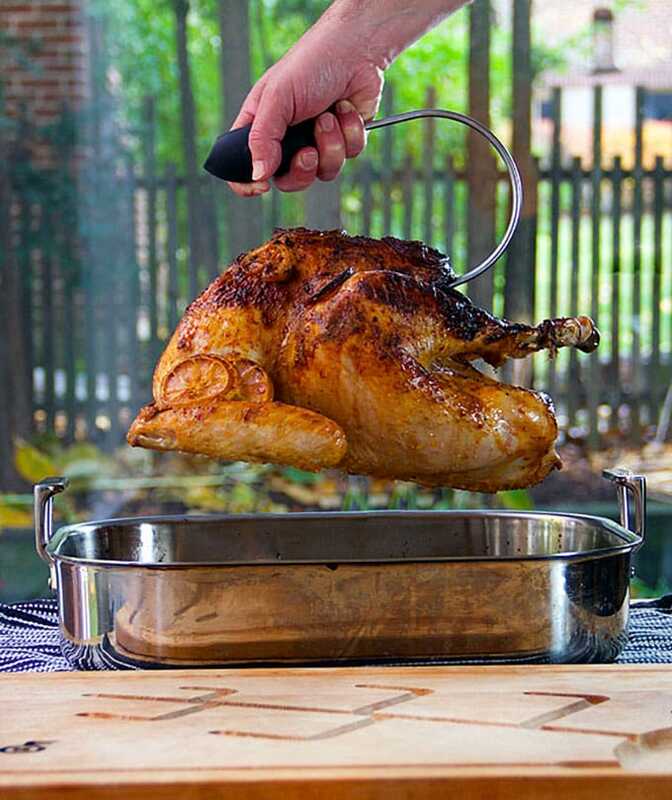 Lower the heat to 350ºF and roast the turkey for 2 – 2 1/2 hours longer, or until a meat thermometer inserted into the thickest part of the breast registers 161F – baste every half hour with pan juices – add a cup of stock to the pan when it looks dry – if any part of the turkey is getting too brown, press some foil over it. 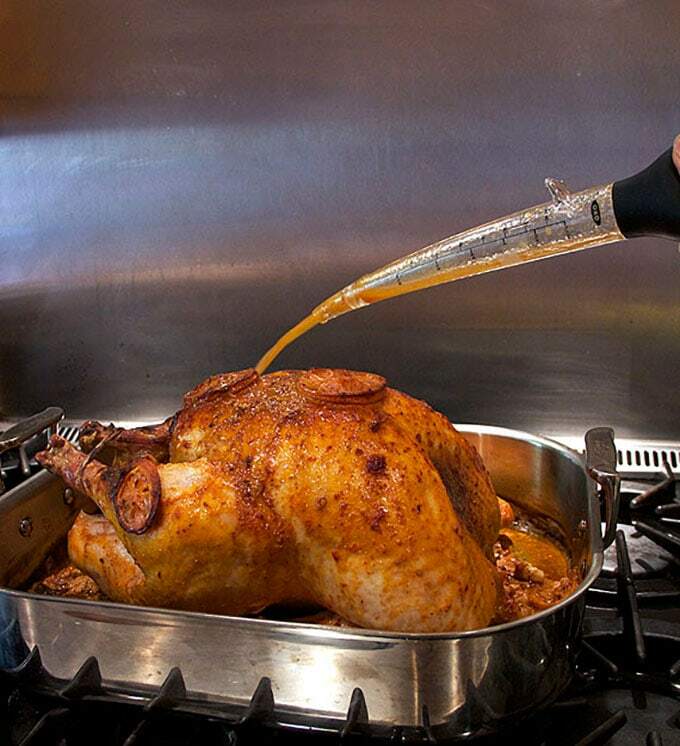 Make the Gravy Transfer turkey to a platter and tent with foil while you make the gravy. Remove the roasted garlic and lemon slices from the roasting pan and set aside. 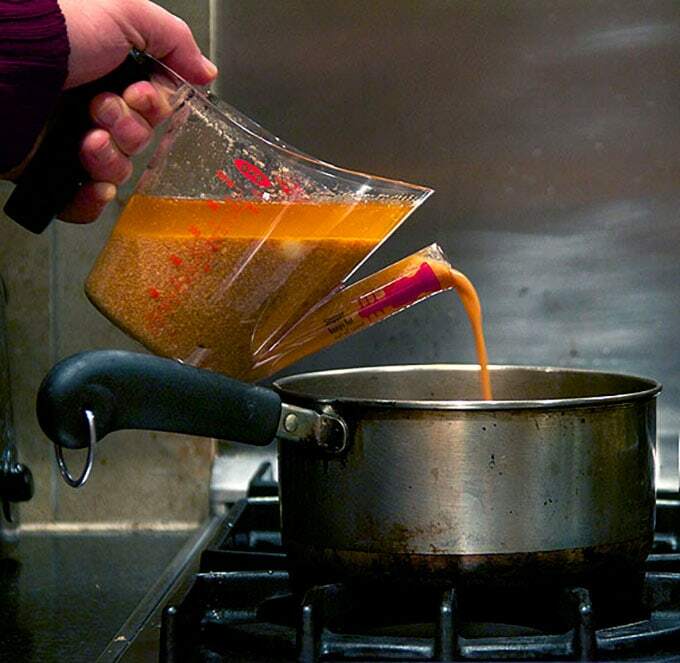 Pour the liquids from pan into a gravy separator. (do not clean the roasting pan) Wait a few minutes until you see that the fat has risen to the top, then pour the liquid into a medium sized saucepan. Set the fat aside. Set the roasting pan on the stove over two burners set to medium heat. Add a cup of stock to the pan and stir, scraping the bottom with a wooden, spoon to release all of the flavorful brown bits. Turn off the heat and pour liquid into the saucepan. Add the roasted garlic to the pan. I like to spoon in a couple of tablespoons of the fat for flavor – you can leave it out entirely for a non-fat gravy or add as much as you like for a richer gravy. Puree the Gravy Puree the gravy with an immersion blender or in a blender or food processor. Return it to the pot (if you removed it) and thin with some broth until you get your desired consistency. Season with salt, to taste. 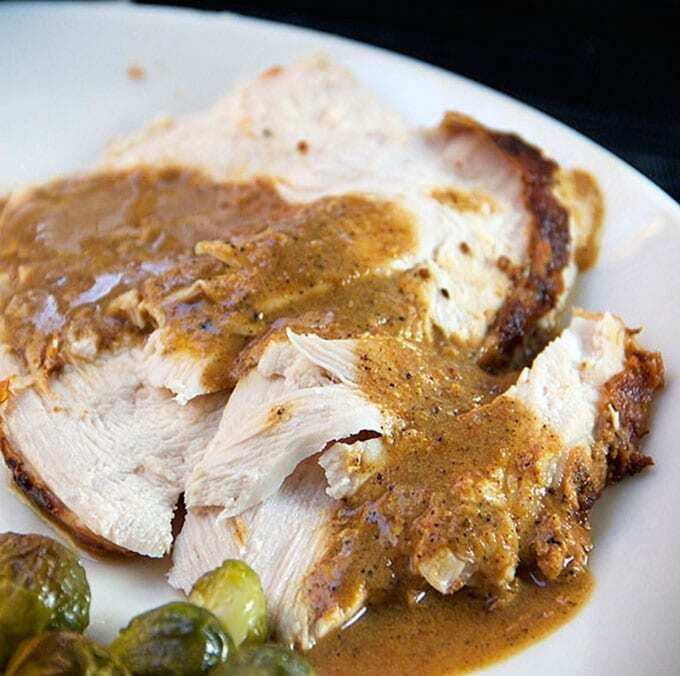 Slice turkey and serve it with spicy yogurt gravy. I Helen – who would guess that a trip to the doctor would lead to yogurt marinated turkey 🙂 I’m so glad you found Panning The Globe. I’d love to hear back about how the yogurt turkey turns out. Happy Thanksgiving! I prepared the spicy yogurt marinated bird, adding ginger, seven spices, skipping the oil( i simply forget it) . I washed the turkey, dry it, massage it with lemon wedges and added the spread the spicy yougurt all over, let it stand over night; on Thursday afternoon I prepared the Reynolds bag, insert the turkey inside the bag added some cut onion and garlic and close the bag. I heated the oven to 350 degree (as indicated for the bag) two and a half hrs later turn the oven off . Take the bird cooking pan out , let it stand half an hr than opened the bag and cut a piece of the turkey breast for tasting. OMG it was juicy and tender and delicious. My sister who usually does not eat chicken or turkey, find it appealing! My niece who said ‘thank you I am done ‘ after a second bite of any dish, got a second serving of the bird meat and when diner was over her mom waited patiently while I was packing a container of turkey meat to take home with her. We were five adults and two teens at the dinner table. Everyone requested a slice of the turkey breast. My niece said the turkey was very good; my nephew ate nothing but a large serving of turkey no stuffing no cranberry no mashed potatoe… thank you so much for the delicious recipe. Our thanksgiving dinner was a success! If I marinate it for 24 hours will the turkey be real hot spicy. Hi Jackie, Aleppo pepper is not super hot like cayenne. I think it will be fine. The skin will be good and spicy – a nice kick but not super hot. Lisa! We did your marinated turkey recipe for Thanksgiving. The breast meat was SO tender and the gravy was a breeze. Because of the yogurt and spices the gravy was already thick and flavorful. I actually used some of the fat I skimmed off (instead of butter) to make more gravy, since we never have enough. Wonderful! Thanks so much for all your work. We love it!!! I’m so happy to hear that you loved the Turkish Turkey Susan! Thanks so much for letting me know. And I agree – you can never have enough gravy! 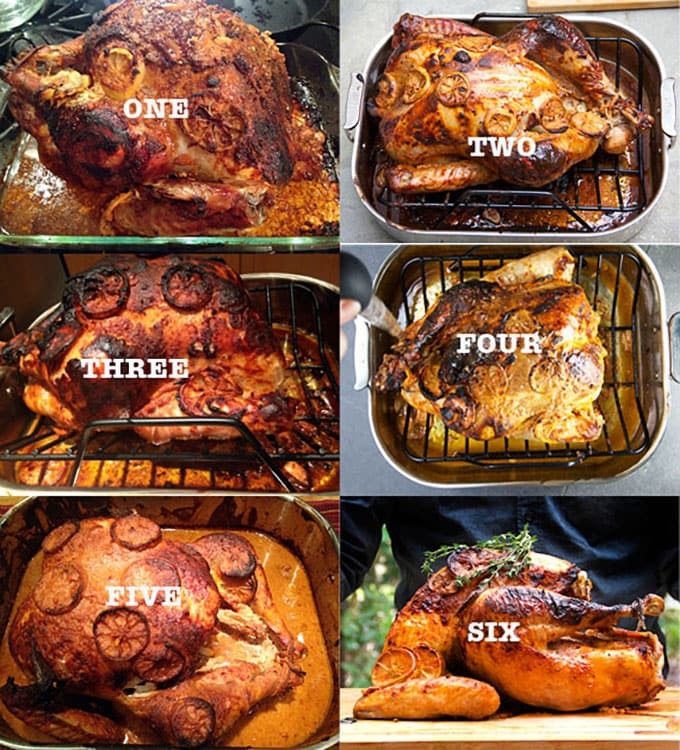 post on having the ultimate turkey. And what was the end result was not what I would have thought would be the best way to do. I love surprises so that works for me. You are nuts, but I find that charming. Ha! that looks amazing! I would really consider trying this.! This sounds so yummy! I am going to try it on a chicken first with the yogurt to see how that does before trying the big bird. It’s been hit and miss with Turkey for me over the years and have yet to find the perfect go-to recipe. Hope this turns out to be a winner for me! Thanks! 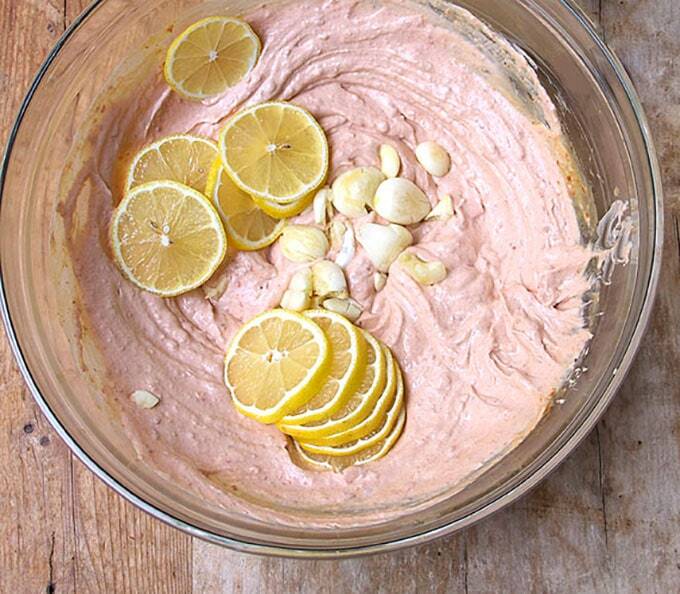 Oh, I love the sound of this Turkish Turkey (had to write that:) recipe and interesting about the yogurt. I love using sheep yogurt for cooking because it doesn’t split as readily and now I know why. We don’t celebrate Thanksgiving in NZ but we do have turkey at Christmas so am thinking of doing this recipe then – thanks Lisa. 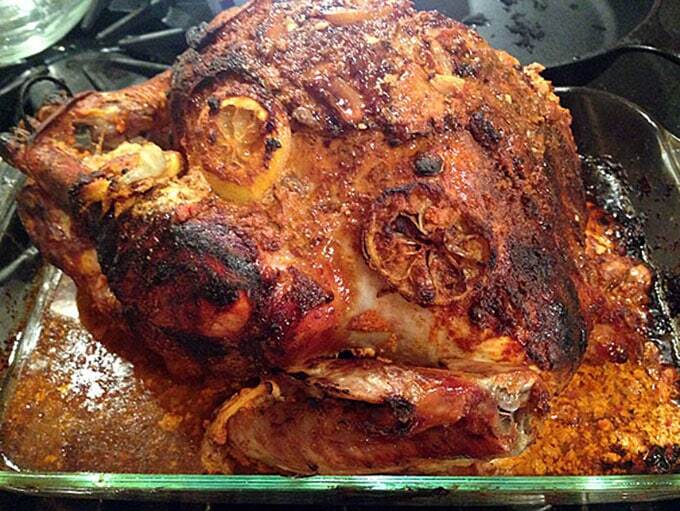 Lisa, thanks for all the hard work and multiple turkeys you cooked to develop this perfect turkey recipe. I’ve cooked chicken like this before and it was delicious. I’ll give it a try after this “holiday” is over. My son-in-law is cooking the holiday turkey. We’re going to my parent’s house for Thanksgiving this year so I am relieved of turkey duty, BUT I do want to try this recipe! Maybe I’ll make a Christmas turkey! I appreciate all the testing and will make note of the yogurt! This looks and sounds fantastic! Our friends cook the turkeys every year but this year,I am going to buy a small turkey just so I can make this recipe (and so I’ll have left overs). Uffra and Aleppo pepper have become staples in this house thanks to your blog. AND JB is making the Colombian chicken stew this week. The bonus of your hard work and recipes is that JB interested in cooking. Thank you.